We leave from George's home to airport by taxi, where we met Nikos. In flight we were allowed to have up to 23 kg luggage per person, we pass the check-in normally and fly with Qatar Airlines to Doha. After waiting for a few hours in Doha, we arrive with the next flight to Delhi after midnight. From the airport by taxi (650Rs) arrived at the train station where we found a hotel with 4000 Rs (rupees) for one and a half day (too expensive for the quality). We stayed for several hours to rest in the room. In the afternoon we went for a walk in the neighborhood which was much better than the last time I had visited in 2010. Even the people were more civilized. With 600 Rs took a taxi at 3:00 in the morning for the airport. After some time search, we finally met Panos who had arrived a few hours ago from Italy via Amsterdam. At check-in for our flight the Leh, we had luggage 8 Kg overweight and asked us 1650Rs and they paid an adjacent fund. The flight lasted 1:20 AirIndia until Leh where we arrived at 8:20. In flight we saw dozens of Himalayan peaks above the clouds. By taxi arrived at the Padma Hotel where we met Bickey. The Padma Hotel was complete and finally stayed in a new Guest House next door. We discussed the possibility Bickey for organizing the trip and we get some ideas. At noon we left and after we got offers from a few offices went to Sky High Treks where we met Tsering and made an initial costing of the mission. Eventually, the total cost of greatly increased. We spent all the day walking around on the streets of Leh. In the evening we had dinner at the restaurant of Padma and slept relatively early. After much thought and discussion we decided to work with the Sky High Treks since it seems to have better knowledge of the area, access and organization. Finally, the total cost came out 2450 euro much higher than originally calculated ratio of the high cost of travel and the fact that we needed two vehicles to ourselves comfortable together. We continued to purchase personal materials and food for the trip and the afternoon in the office we met the cook us Nirot from Nepal, a professional cook and assistant Stanzin Gonbo from the village Raru. In uploading the problem arose in the second car and had to pay 15000 Rs above it. We have dinner in good restaurant and rest for the long journey to the mountain. At 6:00 in the morning the jeep arrived at Guest House and we load our luggage and departed. Today was a national celebration of the release and almost everything was closed. The jeep we were going very slowly while the second had a problem with the brakes and stopped for repair. The landscape was lunar and the road going up and down gradually by the large tributary of the Indus. Eventually another jeep came and replaced the problematic, so we had to wait quite a bit. We went through the monastery Lama Yuru and then the road climbs and the asphalt and the road became dirt road passing from Fotu La pass at an altitude of 4100 meters. Large sections of the road was dirt road and the speed of the jeep was from between 20-40 km/h. Passing and the last pass, the road descends for over 2000 meters elevation and ended at key city Kargil. Most residents in Kargil are Muslims since the city is located near the border with Pakistan and a few years ago the Pakistani army had occupied area of Kargil. 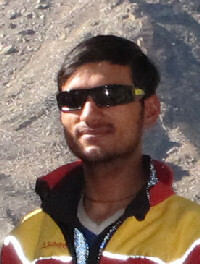 In Kargil, we must to change jeep and wait for two hours to find other jeeps and to continue towards Padum. Initially there was asphalt but when we took the road to Zanskar valley it was dirt road. The road ascends passing through the slopes. It was late in evening and eventually could not continue further. In the village Parkenchik found a refuge (Alpine Hut) and overnight with 50 Rs per person. The cook prepare dinner and slept at 21:00. From the shelter seemed a sub-peak of the twin mountains Kun and Nun. Before dawn, the breakfast was ready as well as the bowl of snacks for the trip. From the shelter seemed some of the peaks of Kun. We left at 6:30 and the weather was much better than the previous days. 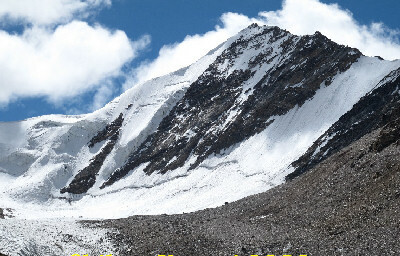 The route was very beautiful with plateaus where there were scattered Tibetan village at 4000 meters. 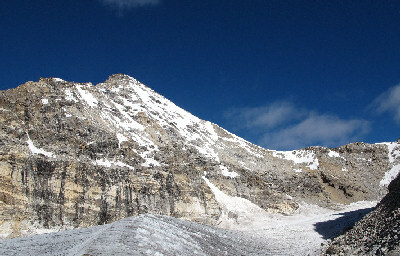 We pass over Phe pass 4310m from where front and below us seemed a large glacier at 3300m. Beside of the glacier there were many granite peaks and high snowy peaks in the distance. 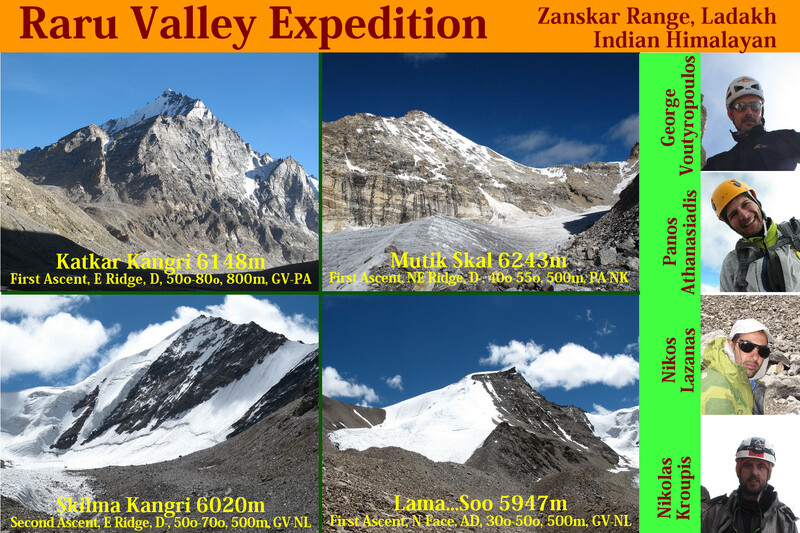 After Phe pass, we enter the main part of the valley Zanskar. 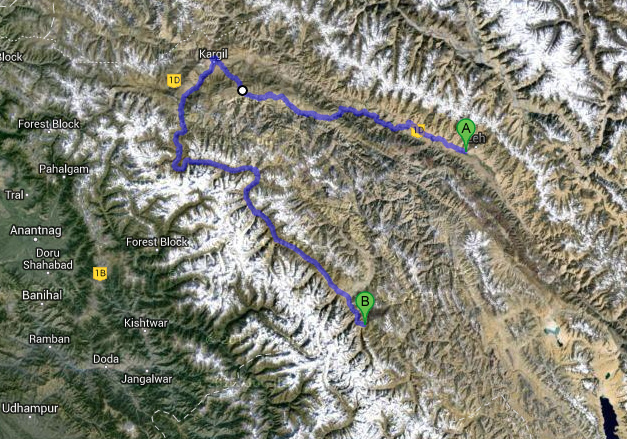 At 14:00 we arrived in the capital of Zanskar, Pandum. After intra-day waiting we found a van that took us all together in the village Raru. The route was quite steeper. At 17:30 we arrived at the village and camped in the large vacant lot next to the school and student focus of the village (3750m). It was a mistake that we chose this point because the president of the village saw us and came over and he asks us to pay for camping this day and for all the days that we would stay on the mountain. It would be better to go low on the bridge, distant from the village. I spent a restless night with pain in the gut and diarrhea. In the morning we woke up at 6:30 and after breakfast we departed at 7:45. The point of the GPS which denotes the BC from the Swiss expedition was not right. Eventually we return back we chose to do the base camp, in the place where the river of the Skilma Kangri joins the Katkar river. Here they had made camp the British mission in Skilma Kangri in 2009. There was a square building with stone walls of 50 cm height. The tents were set just 10 meters from the main river and between the two branches of the stream coming down from Skilma Kangri at an altitude 4460 meters. We get water from the stream coming down from Skilma Kangri but it was quite cloudy afternoons. We tried to cross the great river valley Katkar, reach the middle of the river and realized that we could cross the Katkar, if we try in morning when the water is reduced, in order to approach the peak R26. Late in the morning we started from the BC (9:40) to look for a route to the peak R35 and to move our equipment near to the peak. Initially we went alongside the river for about 2 Km and just before the lake Katkar, we ascend the steep slopes on the left. It was quite difficult and tiring climb. Near the morena (~ 4850 meters) the stream which is coming from the left side of the peak R35, it passes through a basin with low velocity but very wide. From here we decide to cross the stream, where is seems to be safer. Our legs ached from the cold after the width exceeded 100 meters. Nick could not be passed and continued to climb the left side of the stream. We continued on the right side of the stream and at 5100m met the glacier. Panos and me tried to cross the glacier and to pass to the other side but we could not pass, since the torrent was running over the glacier into two large streams at high speed. We got up to 5230m and we returned back to 5130m where we left some equipment under a big rock. Descended lower and met George. All together we return to BC by the same route. Crossing the stream we met Nick and we all got back together in BC tired at 18:15. Today we stayed in BC for rest though the weather was good. 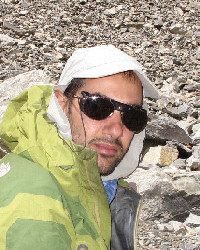 Panos (alone) climbed very quickly to the valley Skilma Kangri reaching the altitude of 5150 meters. At 7:30 we left all together for the mountain. Following the same route which we followed 2 days before. We pass early morning river which has less water. At 11:30 we arrived at the point of bivuac at 5150m. Resume higher the glacier and got up to 5440m from where we had views all tops R33-R35. From here we spotted a possible route of ascent to top R35, and decided to try out here the next day. The route would be from the southeast side, the back side of the side we saw the BC. Returning to the point of bivouac ate but soon it started to rain. Initially we thought we could spend the night outside but when we enter into the sleeping bags we realized that was completely soaked. Nick with George began to dig a hole under a large rock to spend the night. I and Panos decide to return back to the BC. At 18:30, we started running and we arrived in BC at 19:50 in dark. We had a difficult night without sleeping and with minimal clothing. I did not sleep at all. We worry on how to spend the night Nick and George underneath the rock. BC 7:30 - Bivi 5150m 11:30 to 12:30 - Glacier 5440m 14:20 - Bivi 15:30, rain 17:00, Bivi 18:30 - BC 19:50. From morning at 5:30 I woke up I began to suffuse the wet clothes and sleeping bag to dry. I was luckily, because it was a sunny day and the clothes dried until afternoon. At 9:30 we talked with George and Nick and informed us that he was well and that they started the comeback. Before noon they were back to the BC. The afternoon was windy and it has a drizzle. We had a leisurely breakfast and we prepare our backpacks for the camp. We ate lunch at 12:00 and departed. The river had a lot of water and the passage from the flat point wearing boots. Upon arriving at 15:00 at the camp we erect the tent and started to rain a bit. Three of us sleep into the tent while Nikos, under the rock. We woke up at 2:15, but we leave at 3:45 until to get ready and drink hot drinks. 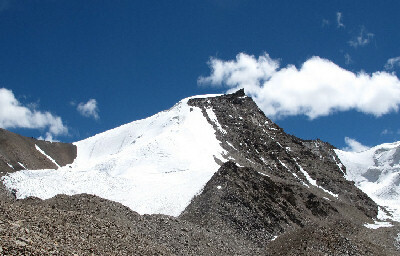 With fixed tempo reach the SE side of the peak. The first part of the slope of the peak has gravel and quite fatiguing to the climb. In the first waterfall we passed easily from the ramps on the right side. After we enter into the snowy gully for over 100 meters and traverse right we got a big rocky section with loose rocks. We are climbing on the rocks reach the long snow slope below the summit. We are climbing solo, eventually ice was inclined up to 35 degrees, in the last part before the south ridge. 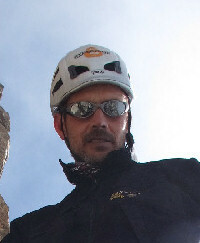 Panos climbed the rocks and approached the summit's tower, which was 300 meters away. The summit was very steep and impossible to climb with the equipment that we had. So we stayed on the south ridge at 6088m (8:30 to 9:00). We returned by the same route to the camp where we arrived at 12:00. Nick was not feeling very well so he stayed in camp to rest. I returned alone to BC where I arrived at 15:30. 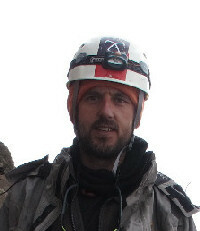 Panos and George remained in camp to try again the top R35 but the steep eastern ridge of the peak. On waking in BC I expect to see George and Panos on the east ridge of R35. With binoculars I watched on the ridge (8:30) the two climbers to climb slowly the ridge towards to the top. At 10:00 Nikos arrived in BC coming from camp. At 11:00, the weather was bad, and it is started heavy rain. We are concerning for George and Panos because of weather. Finally at 12:30, we receive a message that they reached the summit and it was snowing a lot. They did 11 rappels managed to reach the camp at 19:00. Shortly afterwards Panos called us and we learned the good news, since it was really a great success under difficult weather conditions. 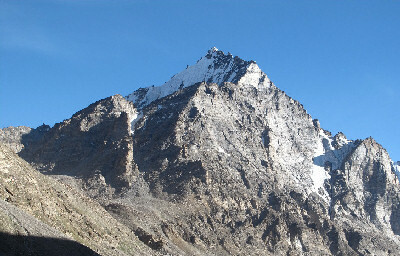 We named the peak as Katkar Kangri because is standing impressive into the middle of the Katkar valley. Day of rest in BC and preparation for the second draft of climbs for the next few days. The plan was changed, Nick and George decide to climb in Skilma Kangri area, while me and Panos to try the peak R26 that was pretty great access. We spend the day with arranging equipment and food that we will transfer each group higher. George-Nick: The depart from ΒC latter and they make camp next to the lake (Skilma), a few meters lower from the place where I left a few equipments. A difficult evening passed very tired the previous day. However at 6:30 and woke up two hours we began the descent (8:15). Descend to the main glacier was blocked by vertical cliffs. We left the backpacks on the glacier and climb up on the main glacier to have some glipses of the R26 from the south face. There is possibility to climb from the south face but all the face was with ice, and the slope was over 60 degrees steep. We quickly descended to the glacier. The return was also equally difficult, but more relaxing. Finally at noon we reached the river Katkar river. When I am trying to pass the river I fell and knocked a little leg. It was noon and the river had a lot of water. Eventually we arrived in BC where we met Nirot and Stanzin. Early in the morning, Nick with George reached the BC. They were a little tired of the four-day climb in Skilma area. The day passed with rest in BC. This was a lazy day in BC with preparation and packing equipment for our way back to village. Panos leave alone towards for Sumdo onwards for the valley (Nateo) to take pictures of the peak R26. Arrived at Sumdo and then took another valley. Panos found a few streams from the left side (R26) in valley Nateo but he could not climb up because the streams have waterfalls. 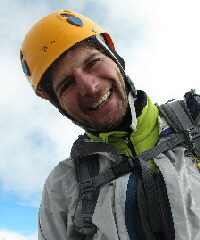 Eventually, Panos enter into next one, which was smoother and he reach the altitude of 5200 meters. On the way he met a flock of goats Ibex. Panos return back to BC late, and he finally arrived in BC at 20:00. It was very difficult to struggle with the water flow to cross the river (Katkar) because at that hour the river have a lot of water. Today was a quiet breakfast and a sunny day. Our only worry was the horses to arrive in BC in the afternoon in able to return back to village the next day. Finally at 16:30 in the afternoon horses arrived in BC as we planned. Everything was ready for the return. As soon as we woke up the car was there waiting for us. A very old kombi van. We left at 8:00 for the Pandum where we arrived after 1:20. In Pandum, we called the office and asked them to change the car, something that happened and eventually started at 10:30 with two jeeps the journey. The trip was tiring reason the road and finally at 19:00 we arrived at the shelter Parkenzik where we stayed the night. Early in the morning we had breakfast and checked out at 7:20. The road was better, after 3 hours we arrived at Kargil. 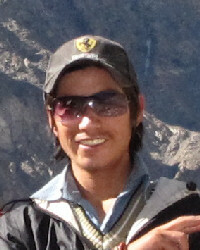 In Kargil we say goodbye to our assistant Stanzin that would go in Jammu city where he was studying at university. We continued on our way without stops, we only stop for to drink tea. After Lamayuru was a landslide and the road was closed, so we waited (14:00 - 16:00) the bulldozer to reopen the road. Tired arrived in Leh and we met Tsering office and suggested we stay economics at Guesthouse Namdruk with 450 rupees and 300 rupees double room without bathroom. The guesthouse situated quite far from the center, on the upper side of Leh. Took a whole day to sort out the account with Sky High Trek and do necessary shopping and gifts. We had a tasty dinner at Peguine Garden restraunt. At the day time, walking in Leh I met Dimitri Despiniadou with Dimitri and Chris who had come to make a great hiking trail in the area. After a leisurely breakfast at 11:00 we rented a motorbike Royal Edfield. Panos was the driver, we went together to the Monastery, in the Palace and finally in Stoupa (Santi Stupa). A very good experience. At noon we met George and Nikos and they did the same route with the motorbike. The taxi was at 5:00 in the morning at the guesthouse. We are loading our luggage and at 5:30 we arrived at the airport in Leh. We had to check-in without weigh our luggage, but we had trouble with the hand luggage. In the cabin were not allowed to have clothes, shoes and other things that are allowed in all other airports. In the end, Panos passed the hand luggage as normal luggage. The flight went well and at 9:00 we landed in Delhi. At 10:30 we arrived by taxi (650 INR) in Hotel Aman International hotel near the train station. After two hours rest we took a taxi for five hours to make our tour to Delhi. First we stopped at a Hindu temple after an hour stop at the National Museum and then went through the Lotus. The afternoon we arrived at the hotel and in the evening we had a luxurious meal at another hotel restaurant. Panos says goodbye and he left towards to the airport at 21:30. We departed hastily at 7:15 towards to the airport by taxi, since we had little time to flight. Fortunately everything went well and we did the check-in without problems. The return flight was quite boring, but we had clear weather and good view. At 18:00 we were at Eleftherios Venizelos where Thalia and Stefanos were waiting for me. We went home and Chryssoula and Lefteris. The next day, we went back to our village.